Two Reflective Teachers: The Unstoppable Writing Teacher: A Must-Have! 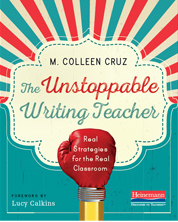 On Monday, I wrote about The Unstoppable Writing Teacher by M. Colleen Cruz, but I did not even remotely do it justice. There is so much to say about this book as a reference for teachers, instructional coaches, administrators, or anyone else who works with developing writers. First off, let me just say that Colleen Cruz had me hooked from the first line of her introduction which was "I am a pessimist." She follows that line with a series of pictures that I will leave for you to discover. Her challenge to readers is to figure out the meaning of these pictures while reading the book. Love. That. Then, the rest of the introduction validates how hard teaching can be, but encourages us to see challenges as opportunities. Love that, too. Except for the first and final two chapters, each chapter revolves around a common statement that teachers are likely to say about teaching writing, and, with the exception of only one, I have heard all of them. Here's a sampler of some of the chapter titles. Don't these sound familiar? "I don't know what to teach the student. He's a much better writer that I am." "I can't seem to get my students to stay writing unless I'm sitting beside them." "I don't feel prepared to work with a student with such big challenges." "I teach grammar, but my kids don't learn it." Every--and I mean every-- chapter is full of practical advice and tools to use in the classroom. For example, there is a curated list of possible mentor texts to use with sophisticated writers for several genres, where the columns are "If your whole class mentor is usually:" and "You might try this." Just like that, I have another whole set of mentor texts at my disposal to share with the teachers I work with. So many of these lines spoke to me, as a trained special education teacher, as well as a writing coach and coordinator. When I work with teacher in upcoming years, I will definitely have some of these pages copied and highlighted for teachers to process and reflect on. Another chapter that I will have ready to share at all times is Chapter 5, "I'm finding some student writing repetitive and boring." I love how Colleen reminds us that we need to find moments of importance within our lives; these moments don't have to resonate around the world, but they have to resonate with ourselves. When we model and teach students to be on the hunt for the moments that matter to in our lives, we teach more than writing; we teach them the value of their lives. Colleen ends Chapter 5 with a bulleted list of how to maintain the conditions for risk-taking within writing workshop. If (when) you get this book, put a stickie note on pp 54-55, copy them, and return to them often. Each bullet is worth a lot of reflection and thought. Every one of these tools is going into my toolkit as resources to share with teachers. Any one of these could make the book worth its cover price of $21. But wait, there are still final thoughts in an inspiring, validating, and emotional conclusion. You not only figure out the meanings of the pictures from the first page, but you also feel great about the work that you do. Thank you, Colleen. You have created a gift to all teachers of writing. I've been reading so much about this book that I brought it with me on vacation. It feels like Colleen and I are having a conversation. It's the voice in my head. You have picked out some strong points here. Even though I teach gifted students, I have many of the same issues. I have the writer who wants me next to them every time she writes. I have the students who write boring stuff. She also references many of my writing mentors, Lucy Calkins, Georgia Heard, Donald Graves. Thanks for the recommendation. This book is on its way and I can't wait. Thanks for the detailed descriptions and pages to post-it! I just finished this book yesterday and couldn't agree with you more! It's definitely becoming part of my toolkit. Thanks for highlighting so much of what is wonderful in this book. Love the scaffolding quote! It should be top of mind every time we plan a lesson or sit beside a student. What Colleen says sticks. It is definitely worth the price of admission!